Truth Or Slumber: Left Verses Right: Astounding Change On Illegal Immigration In 20 Years! The US has undergone an absolutely astounding change over the last 20 years. What was said then by our leaders and was taken as common sense—now causes rioting in the streets. 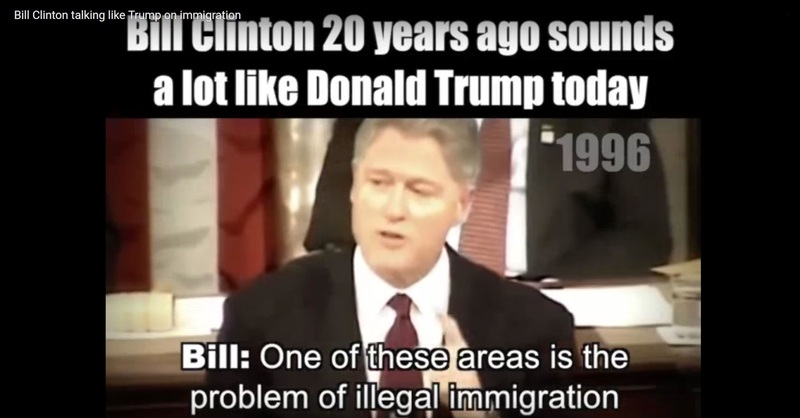 Whether you love him or hate him, watch the embedded video below and listen to what Bill Clinton said in 1996, and then compare it to what Donald Trump is saying now. You can simply marvel at the how similar their words are, or wonder about the complete disintegration of our nation at the hands of the brainwashed masses—and the media and politicians—and the RICH who own them both. Now, when the exact same thoughts and beliefs Bill Clinton spoke about are expressed, there are huge numbers of people who rant and cry out: "RACISM", "RACIST", "HATE SPEECH"—or violently attack people, throwing eggs and hurling obscenity laced insults and on and on. What is happening in this nation? Comments are welcome but any that contain hate speech, threats of violence, profanity and so on, will be deleted and forwarded to law enforcement when appropriate.